This time next week, Mr. P and I will be back in Cabo, poolside, drinking Pacifico and eating fish tacos. Ahhhhhh. While we went through the process of getting the baby a passport, thinking we may vacation somewhere new (this will be the 4th consecutive year we’re going back to the very same resort) and as a family…we opted out of taking Shea. We were just talking our trip last night – am I sad to leave the baby (of course), am I nervous to leave the baby (a little, but that’s just because we have our little routine and by this point, I have a pretty good understanding of her various needs and wants), am I dreading being hooked to my pump the whole time (ugh, yes…but worth it, of course), and am I excited? Yes. Yes! I told Mr. P just last night that I’d be happy if every day on vacation we slept in, went to brunch, shared some tacos poolside late afternoon, and ordered a snack from room service in the evening if we got hungry. Obviously I’m looking forward to the phenomenal food! The brunch and the poolside food is better than most of the restaurants for dinner. Or perhaps that’s because I would choose tacos over a steak any day of the week. I could eat tacos (and Mexican food) every day, all day and probably never get sick of it. To balance all of the food and drink, we’re very familiar with the resort’s workout facilities. While Mr. Prevention prefers to hit the gym in the morning, I prefer going in the afternoon. As you may very well know, morning workouts have always been tough for me. And in this case, I hate to shower before sitting out in the sun all day, or conversely, going to lay in the sun all stinky for the day. First world problems, I know. But Mr. P gives me credit that I am very good about heading to the gym after a day in the sun, while he heads to the room to nap. It’s vacation…we do what we want! 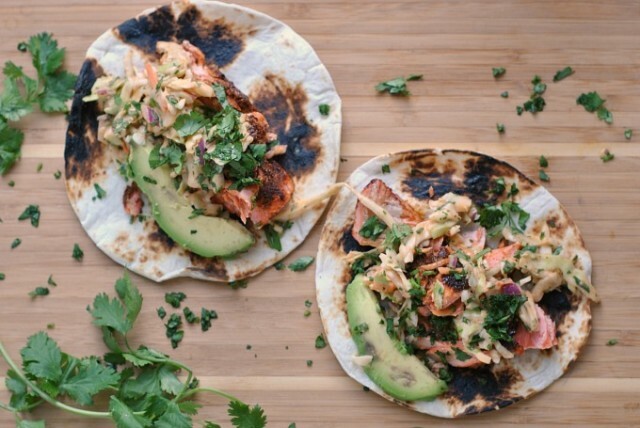 I’ll have to wait another few days for fish tacos poolside, but in the meantime, these Salmon Tacos with Cilantro-Lime Slaw have most definitely curbed my cravings. These were a favorite meal for both of us in quite some time. So much flavor and the perfect amount of heat. Enjoy! In a large bowl, whisk together the mayonnaise, lime juice, vinegar, garlic, Sriracha, sugar, and cilantro, mixing well. Stir in the red onion and slaw mix, combining until well-mixed. Refrigerate until use. In a small dish, combine the cumin, chili powder, brown sugar, and salt; mix well. Rub the spice mix on the salmon (not skin). Heat the olive oil in a large skillet over medium-high heat until shimmering. Place the fish in the hot skillet, skin side down, and cook for 4-5 minutes before turning over and cooking for 4 minutes on the other side. The fish will flake apart easily when done. 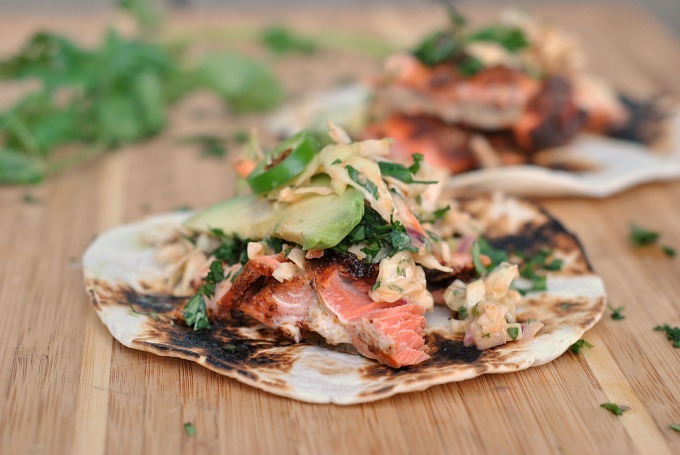 Fill each tortilla with 2½ ounces of salmon, about ¼ heaping cup slaw mix, and 1 tablespoon chopped cilantro; serve hot. So fun!! You guys will have a blast 🙂 What resort are you staying at? Trevor and I are planning our honeymoon and we’re thinking Mexico! Just wanted to tell you I made these tacos last night. Omg these were the best!!!! Thanks for a great recipe. Laura, so glad you liked them! Wow, they look delicious! Gonna try these out tonight. 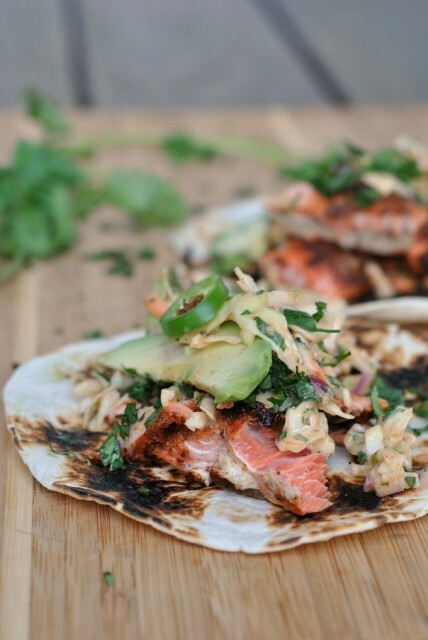 I always love to have salmon as it provides me great protein and the recipe you have shared here is really looking very tasty. I will definately try to have it in my lunch if it really takes me 20 minutes to cook…Thanks for sharing. Yummy! Not only does this look good, but more importantly, it’s healthy. I am saving the recipe to try it out this weekend. Yummy! Not only does this look good, but more importantly, it’s healthy. 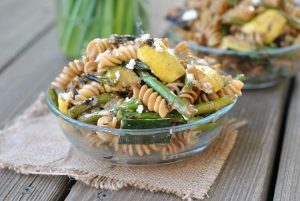 I am saving the recipe to try it out this weekend. Thanks for the recipe. Looking so yummy!!! Planning to surprise my wife with it! Yum! I just made these and they’re really good! Thanks for the quick and easy recipe! Wow, they look delicious! Gonna try these out this sunday. Looks yummy! I am going to prepare this food today. Thanks for making my day perfect. 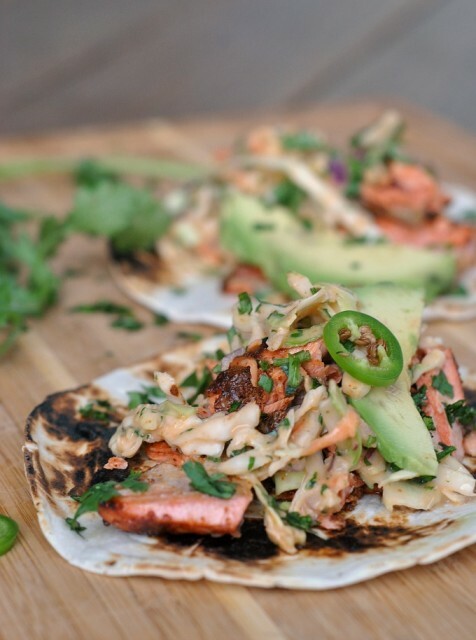 Just wanted to tell you I made these tacos last night. Oh my god these were the best!!!! Thanks for a great recipe. 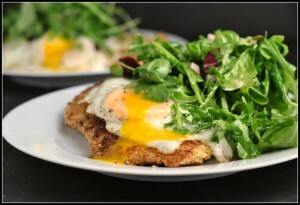 Looks perfect and moreover its very healthy receipe too. I will definately try to have it in my lunch if it really takes me 20 minutes to cook.